I have been a GUMI (Growingupmilkinfo.com) Mum for a while now and was absolutely delighted that their next event was to be up here in the north west. It meant I could attend with J without having to worry about getting to London or sorting out childcare. Hurray! It was the sunniest of days as J and I headed off to the Minikin Emporium for the GUMI Pottery Party. How apt, given that GUMI is an information resource about toddler health and nutrition with a specific focus on the importance of vitamin D. And what better way to build on your body's vitamin D stores than bask in some glorious summer sunshine! With factor 50 lathered all over, of course. 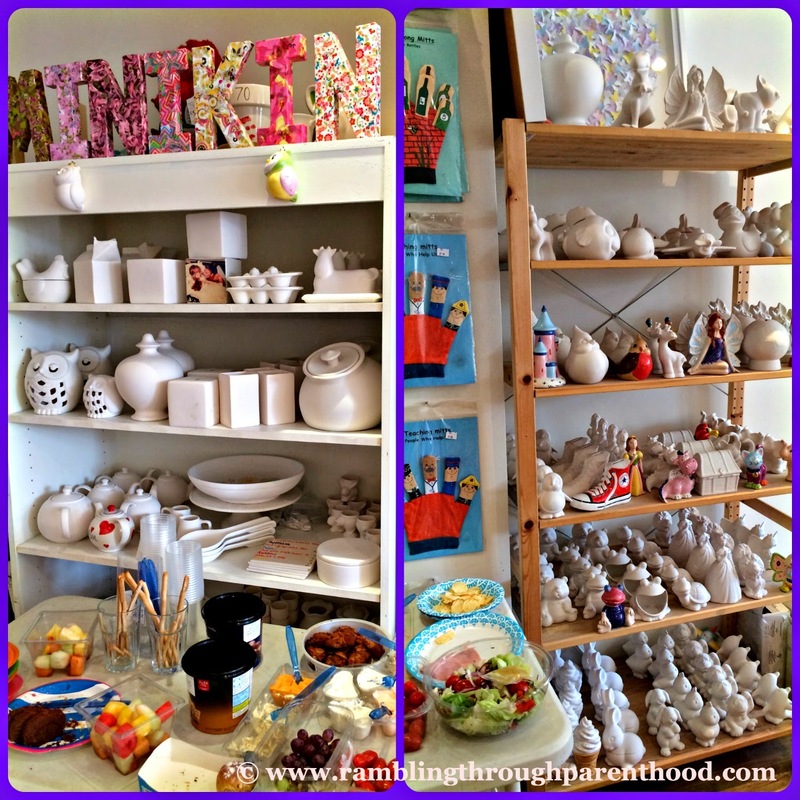 The Minikin Emporium is a delightful little shop and paint-your-own-pottery studio in the heart of Sale in Cheshire. It is conveniently located right opposite the metro station which makes it really easy to get to as well. So there we were, a dozen blogging mums (and a couple of dads) with the kids in tow. Our pottery party started off with a round of refreshments, juice and milkshakes for the tots and hot beverages for the grown-ups. Then it was down to business. We sat down around tables all set with paint brushes, cups of water and paper towels. 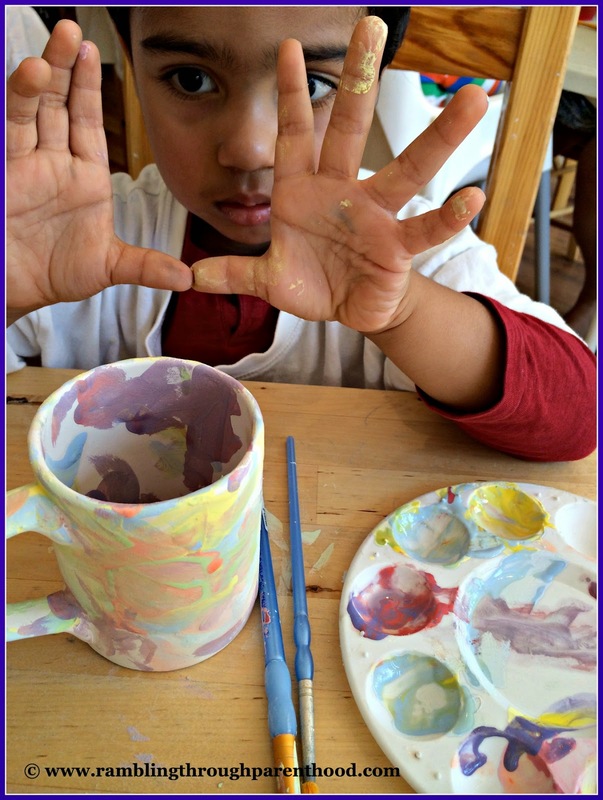 Each child was given a ceramic mug to paint on, their blank canvas so to speak. They donned large white T-shirts to protect their clothes as they set about creating their masterpieces. All under the guidance of the lovely Claire and her team at Minikin. J was a little reluctant at first. He was too preoccupied with his orange juice to bother with any painting. After a bit of coaxing and cajoling, he was soon on his way. Brandishing the paint brush first with one hand and then with the other, he set about creating a colourful masterpiece. I watched as his confidence grew with every brush stroke. Claire had given us an initial palette of colours. J dabbled with the blue, the yellow, the green and the pink. He was soon making requests for some other hues as well. So we added on some orange and red and purple to the mix. Soon he had his pot painted inside and out, and the bottom too! Now, the Minikin is not just about pottery. They house the most gigantic sweet shop along one end of the studio. I must say, despite ample opportunity for distraction, J stayed absolutely focussed on the task at hand and went about his painting with an almost professional demeanour. And there we had it. The masterpiece was dabbed at, splashed on, blobbed over and then it was all done and ready. To go and get glazed in a hot oven. But not before Claire had written J's name down one side in a bright blue. The painting all done, it was time for lunch. And not a moment too soon. Creating a masterpiece is hungry work after all! So as we all tucked into a lovely picnic lunch, some of us managed to catch up with some of our fellow Mummy bloggers. And the fantastic team from GUMI as well. GUMI is evolving into a very good resource on all things related to toddler nutrition. 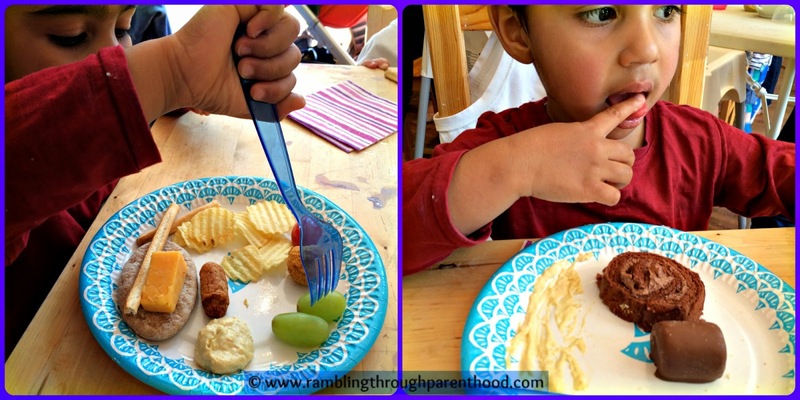 There is information on toddler development and healthy eating. They have an excellent team of professionals on board discussing key issues like vitamin D and fussy eaters. Toddler chef Fiona Faulkner has shared some really handy recipes too. Perhaps they can include information on other key vitamins and minerals and their role in toddler growth. And an interactive forum for readers to post queries would be really useful too. Thank you, GUMI, for a lovely time at the pottery party. It will be a few more days before we get to bring our hand-painted, bespoke piece of ceramic back home. And then J can have his daily drink of milk in it. Disclaimer: We were invited to attend this event organised by Growingupmilkinfo.com as part of their blogger ambassador programme. All opinions expressed are my own. What a great event! Pottery painting is always good fun isn't it! We've had many trips to our local equivalent, it's great fun! Looks like a fun place to visit. We love to have an art activity to do. I love pottery painting. This post just unlocked a flood of memories, amongst them getting my three-month-old firstborn's hand and foot imprints glazed for posterity. They look soooo tiny now! You have reminded me that we need to go pottery painting to create a masterpiece for Father's Day! 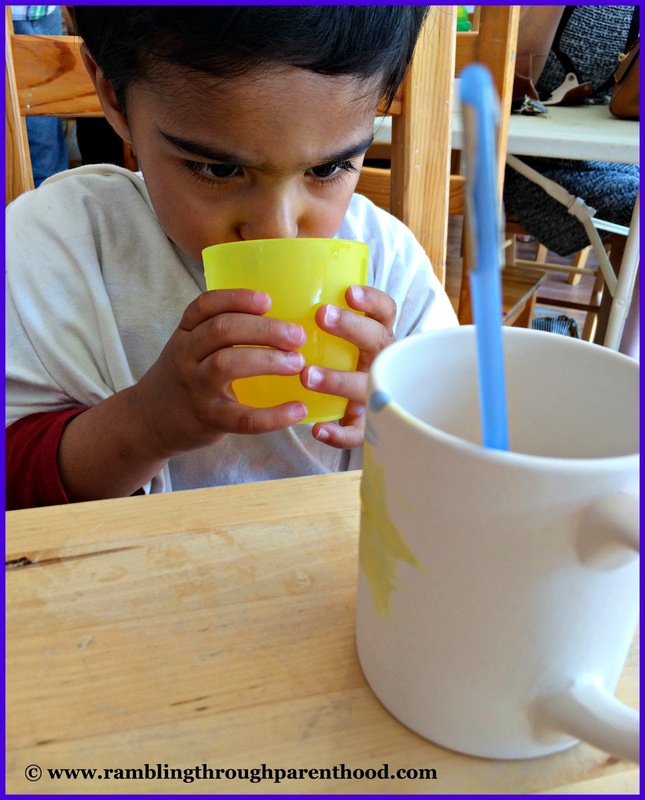 Looks like your little one created a really lovely mug. Great job! This looks so much fun! 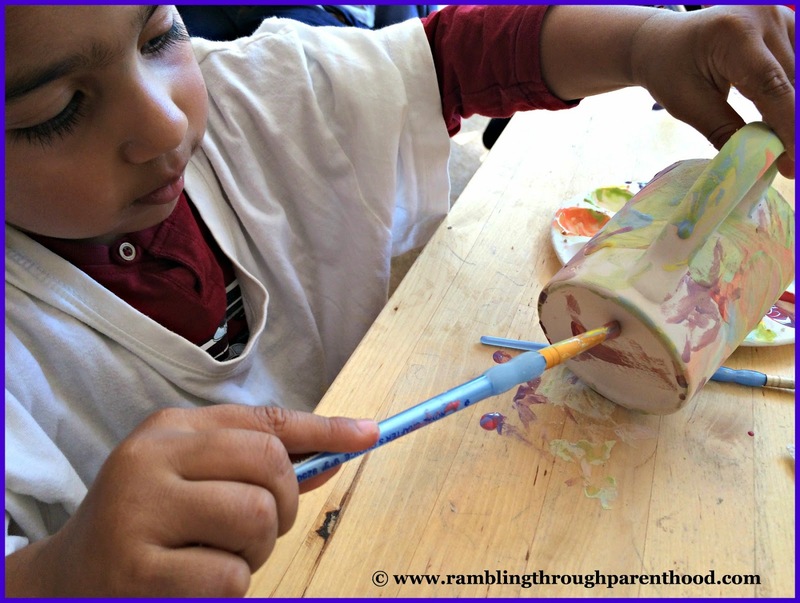 I love pottery painting with little ones - so much fun. Looks like you had a great day! 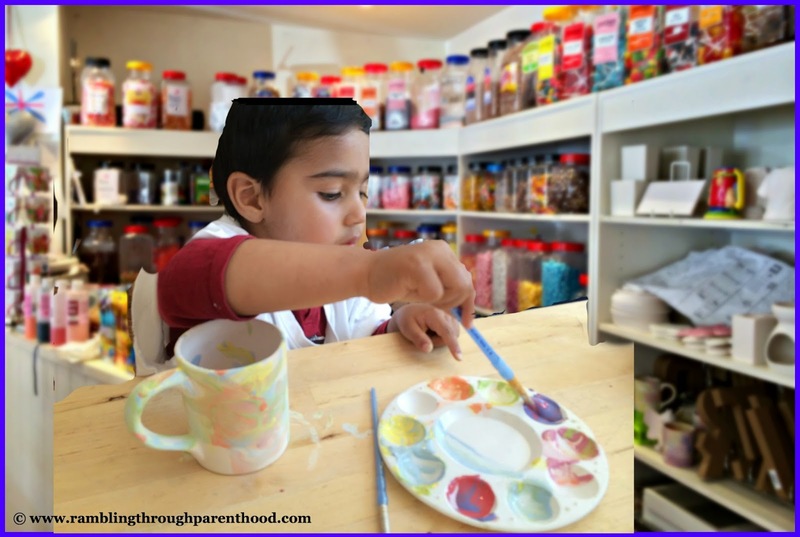 I used to take my two to a pottery painting shop like this all the time when they were younger. We never had a party there but painting a little £5-6 ornament would stave off boredom on those rainy days we couldn't go outside. Sounds like you both had a great day and I love that pot J has decorated!